Develop and implement an inter-agency statement and tool kit to address neglect and deliver sustainable change to improve outcomes for those affected by neglect beyond the life span of the ‘task-and-finish’ group. Use a ‘task-and-finish’ approach to mobilise improvements and to combine and co-ordinate expertise from partner agencies and our local communities. At an appropriate point, in consultation with the MKSB Chair and relevant sub-groups, ensure that this work becomes MKSCB “business as usual”, with robust arrangements to implement and monitor any outstanding elements of the action plan. 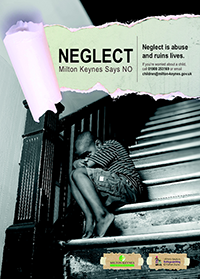 Evaluate the ongoing impact of multi-agency work to identify and tackle neglect in Milton Keynes. The document below summarises Milton Keynes Safeguarding Board’s (MKSB) approach to tackling Neglect. Please also find below the Neglect Screening Tool developed in June 2016.